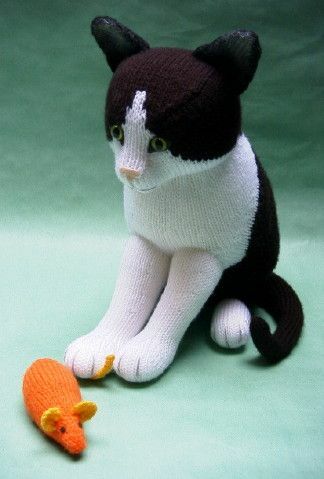 There's no cat napping for this catnip catcher! You will need Of Hayfield Bonus D.K. 100g balls: 1 each in Black 965 and White 961, and small amounts in Silver Cloud 968, Bright Orange 981 and Sunflower 978; 200g of washable toy stuffing; pair of 3mm (no.11) knitting needles; long tweezers; pair of 12mm dull green safety cat eyes; scraps of dark grey and pale peach felt; clear adhesive; black pencil.